Try as he might, Third Man finds it hard always to be open to new ideas, new ways of doing things, new International Cricket calendars. All week he has been trying not to scratch an itch. By rights he should be in a queue in Cavendish Avenue edging towards the North Gate at Lord’s for the 2nd Test. Instead Middlesex play Surrey at t20. Must he sit and itch? No he need not! He can leave a note on the kitchen table reading, “Off to Lord’s, back Monday night,” and pace down to the garden shed where that old Time Machine is gathering too much dust. N.B. Remember to take a step ladder. Setting the machine’s travelling co-ordinates for NW8 9LE he is there in a trice at the back of the Wellington Hospital. No one is about so he hides the trusty step ladder in some bushes in the Close and re-enters the Time Machine. Silly question; 27th of June 1930, England v Australia, an easily dialled 80 years back. Yes, the steps are still there and getting himself out of sight in a garden he makes his way over the wall and into the yard behind the clock tower at the Nursery End. The new Grandstand gleams, the Tavern is reassuringly still a tavern and the Mound Stand, across from him, is filling up, tier upon tier of seating to the dizzying heights of the back row. There is something special about watching from the top seats of the Mound, dark and cool but the light reflects from the arena affording the perfect panorama, like being at the motion pictures. There is a confident air among the crowd that already looks to Third Man as if it well to around 30,000 for the day is done . Two winters before, England easily won the series ‘down under’. And the first Test in this series has already resulted in a 93 run victory for England. Hobbs and Sutcliffe had opened, the Master making 78 in a pair of relatively low scoring first innings: England 270 all out (Grimmett 5 -107 in 32 overs), Australia 144 all out with Kippax not out 64. England’s first innings lead was extended by a further 302 runs with Hobbs again top scoring and Grimmett taking another five this time for 94 in 30 overs. Australia’s bid for victory in the fourth innings briefly promised a cricketing sensation with that young Bradman, who everyone is talking about, scoring 131 coming in at No. 3. Could the crowd’s confidence in England be mis-placed? With Hobbs at 47 (years not runs), Hendren 41, White 39, Geary 36 and Tate 35 there is a nagging concern that the England side is fighting a losing battle with age and capping that, Chapman the captain, has played very little cricket since the previous series. This morning the talk around the ground is that Duleepsinhji, Allen and White will take the places of the injured Sutcliffe, Larwood and Tyldesley. Reliable Leyland we already know is absent. It all must have been a headache for Leveson-Gower, Man and White, the selectors. Here’s cheer, though: England have won the toss on what looks like a wicket filled with runs. But Hobbs falls early caught behind off Fairfax. Woolley then treats us to a glorious hour before he too falls to Fairfax, bringing Duleep to the wicket for his debut against the Australians. At the other end Hammond cannot seem to time a thing and it is no surprise when Grimmett bowls him for 38. Three down for 105. 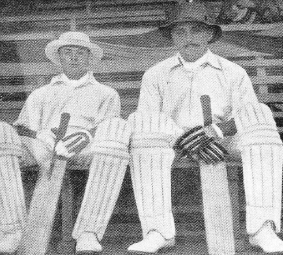 Next Duleep (batting under the watchful and delighted gaze of his uncle Ranji who Third Man glimpses sitting in the pavilion) and Hendren treat us to 104 runs in 90 minutes. The undercooked Chapman fails inevitably as does Allen, but Tate in a stand of 98 with Duleep strikes some lusty blows to the delight of the afternoon spectators who are sitting ten deep on the grass around the ground and field the ball, tossing it back to the despairing Australian boundary fielders. This is better, but Grimmett seems capabale of beating Duleep whenever he likes and Fairfax and Wall with the new ball give him trouble. 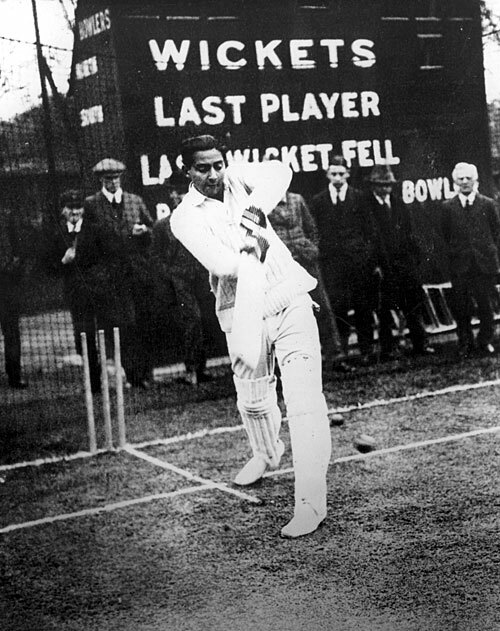 Yet in four and three-quarter hours he takes his score to 173 before, trying to force the pace, he is caught at long off to the bowling of Grimmett. 30,000 stand and cheer him off! But, with the last pair in and the score not quite 400, has England scored enough? “Time” calls the umpire as the first day comes to a close. Post Script. Meeting Ranji on the way down Baker Street, Third Man congratulates him on his newphew’s fine innings that day. It is Saturday 10th February 1912. Archduke Franz Ferdinand is safely tucked up in a bed somewhere. Waves are gently lapping on the shores of the Gallipoli peninsular. Tension is mounting. It is the morning of the second day of the fourth Test between England and Australia who are two one down in the series having won the first test but lost the next two. After heavy rain earlier in the week the Melbourne wicket was drying out on the first day but still yielding slightly to pressure. England winning the toss had already decided to put the Australians into bat and had bowled them out just after five for 191, Barnes and Foster taking nine wickets between them. The wicket had flattened out by the time Hobbs and Rhodes went out to bat that evening and with some beautiful shots and well judged running they had put on 54 runs by close of play. Felix takes up our story on this second day. “Chasing the leather everywhere over the beautiful expanse of green turf were our own men, never once relaxing their activity and energy during that protracted and exceedingly productive partnership between these two able representatives of the famous counties of Surrey and Yorkshire. 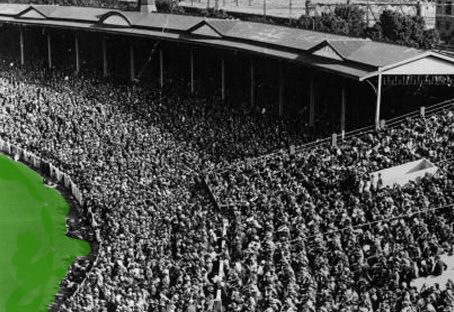 “From the public entrance gates the whole crescent of grand-stand and ladies’ pavilion is filled with watching eyes, tier on tier, up to the summit … All the seats in front of the pavilion are packed. So is the balcony, and even the pavilion roof, where long ago I watched ‘an orange sunset waning low’. 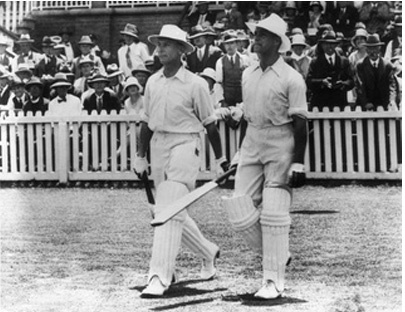 In putting on 323 runs for the first wicket, Hobbs and Rhodes went on that day, to beat all previous Test Match records. It took them four and a half hours. 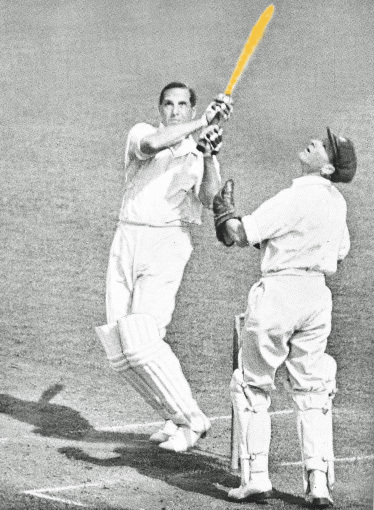 Hobbs was caught behind down the leg side for 178, his third hundred in successive Test Matches. Rhodes on Monday, after the rest day, was later caught Carter bowled Minnett for 179 in England’s total of 589 all out. England went on to win the match by an innings and 225 runs. The attendance that Saturday was 31,795 with the total gate money reaching £1,442. In Zagreb, a young Bosnian, Gavrilo Princip, was asleep in his brother’s house.